My pincushions will be the first items to be showcased in my ETSY shop and specifically my fruit and vegetable pincushions. In my small rural Vermont area I am known as The Pincushion Lady. 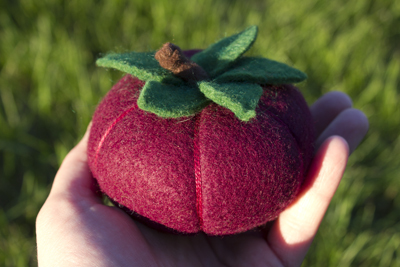 My pincushions are made of re-felted wool blend felt or 100% felted wool. Most, except the mini pincushions and some designer pincushions, are tightly hand-packed with crushed walnut shell to keep your pins and needles sharp. They are bright and colorful, and I have it on good authority that they delight both sewers and non-sewers alike for they are as decorative as they are functional. My fruits and vegetable pincushions are fun and colorful whether displayed and used singly or grouped together . I always forget what is considered a fruit and which a vegetable, but when I looked it up, the definition doesn’t seem to help. 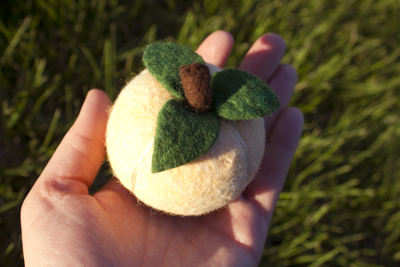 If it has seeds it is considered a fruit, but none of my pincushions have seeds, and yet many are definitely fruits. So however you think of tomatoes, and pumpkins, know that they are as colorful and fun as my plums, pears, apples, and oranges! The traditional tomato pincushion is one of my most popular and comes in different sizes ranging from the 2 pound over-sized variety to the mini-size of only ½ ounce. The mini-sized are filled with polyester instead of the crushed walnut shell filling. 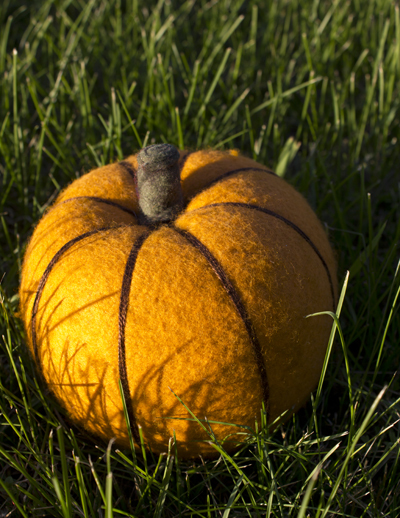 My pumpkin pincushions, likewise come in large, medium or mini-sized and all make nice fall decorations, and will last season after season or use them year round. My customers requested smaller pincushions, as my initial pincushions were designed for serious sewers like myself that like to keep many projects going and use many pins. I now offer medium sized and smaller pincushions learning that many sewers follow the rule to never sew over their pins, and consequently don’t use as many pins as I do. Whichever size you prefer, please note that there are hand crafted needle books to go with my pumpkin and tomato pincushions making for a duet that will please any quilter or crafter! Strawberry needle books are sized smaller and are lovely and useful added to whatever fruit you select. One young customer pointed out to me that my strawberry needle books also make great little books to keep your pierced ear rings in, by simply poking your wires or posts through the soft wool inside. Decorative stick or lapel pins can be safely kept in the top flap. The larger needlebooks could be used for the same purpose. These are only the first of my pincushions to be showcased. Each item is listed singly at this time as each of my creations are uniquely different. If an item is sold out, know that I will quickly replace it as soon as I can. Items can also be special ordered by contacting me. I am learning as I go how many are needed to supply my local shows and my internet market. Thank you for shopping at Little House Home Arts Etsy Shop and do come back to see my other variety of pincushions as well as other creations.